The artist Ann Hamilton creates large-scale, engaging installations that incorporate history and site-specific issues. In her recent work at Mass MOCA, she positioned 40 pneumatic mechanisms that release single sheets of translucent onionskin paper. The pneumatic machines’ actions are like that of breathing, inhaling to lift the paper and then exhaling the paper and allowing it to drop and float delicately down to the floor. Part of this installation is 24 horn-shaped speakers that ascend and descend from the ceiling until they touch the floor at times. On the speakers are voices that speak individually or, at times, come together as one voice in unison. When all the speakers descend, they create a temporary central aisle of speakers that the viewer can walk through. 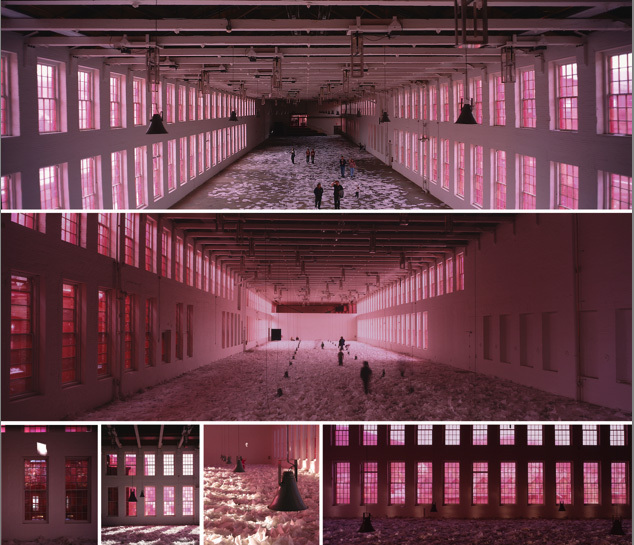 An important component of this installation is several hundred windows covered with red or magenta silk organza. The windows provide the only light in the space, which casts a pink hue on all. Ann Hamilton’s work is particularly successful at creating immersive experiences where smell, touch, texture, sound, and movement integrate into emotionally intense experiences. Corpus by Ann Hamilton at MASS MOCA. Photo copyright Ann Hamilton. The artists, scientists, and inventors above are all reflective of the profusion of intersecting research agendas, which are resulting in emerging genres of artworks and inventions that can be broadly termed interactive sculpture, media art installation, digital art, activated art environments, kinetics, telematics, aural/sound art, and biological art. These new artwork inventions utilize the abundance of inexpensive computing and electromechanical surplus equipment, now available to all, as well as the new access to clear educational reference and research materials available through the World Wide Web. The Web has fueled this explosion, and its velocity is only increasing. Years from now, I believe many will look back at this time as a second Renaissance. Not a Renaissance of purely human achievements, but one that is fueled by our relationship and co-evolution with intelligent machines. We are already thoroughly connected and augmented by computers, which is increasing as computers become smaller and are better integrated into our cities, living spaces, clothing, and bodies. In many respects, we have already become cyborgs. Not the movie cyborgs we associate with Star Trek’s “Borg”, where the technology pierces and invades the flesh, making us mindless automatons. Instead, our cyber-selves utilize highly developed technological interfaces that become transparent over time and fade further and further to the background as our bodies and minds absorb the logic of our evolving machine interactions. From binoculars to telescopes in the collapse of distance and time, or the magnification of the very small through optical and electronic microscopes our machine interactions have become sensory probes for gathering and analyzing and constructing knowledge. As you move the mouse of your computer getting feedback from the virtual cursor that appears on screen, do you really distinguish your physical hand, from the pointer that appears on screen? Alternatively, do you just interact fusing your perceptual self with the virtual extension of self into cyberspace? The contemporary artist Alan Rath’s work demonstrates an inversion of the notion of the body becoming the machine. In this work, Family 1994 the machine becomes the body. 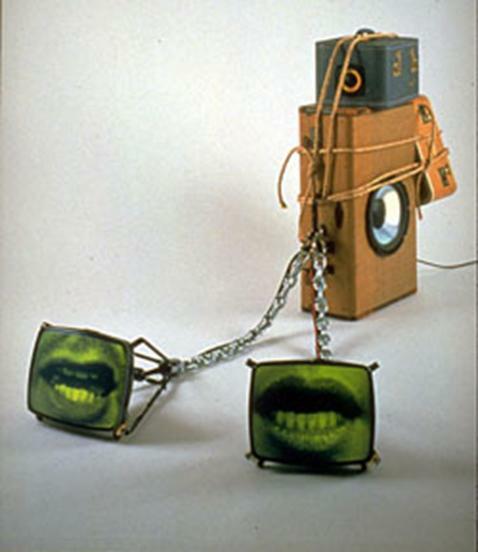 Alan Rath is known for his works that involve research into human behavior, artificial intelligence, interaction, and materials, and he is known for his human and suggestive works. Cyborgs are human beings that are augmented with technology in order to improve strength and ability, unlike robots or androids, which are totally artificial. Family by Alan Rath. 1994. 35” x 36” x 68". Custom Electronics. Electromechanical machines coupled with computer feedback and control already augment and extend humans’ physical strength with robotic arms for cutting through mountains of earth. Large-scale coal mining machines or tower cranes soar upward and permit crane operators to manipulate and position tons of steel in the process of constructing our skyscrapers, which are increasingly more like organisms than buildings. However, the real power of this techno-renaissance is not physical strength, but the informational knowledge that allows us to control and manipulate the physical. The computer-modulated digital radio transmissions that delicately position our satellites in space, or the booster rockets that have placed them in orbit and the width of the fiber optics that snake around our planet are the real measure of our evolution as a species, and they now reflect a planet where robots are increasingly transforming the informational and physical spaces that surround us.